In the previous post, I included a brief overview about mutation breeding for the generation of useful genetic variants in crops and ornamental plants, achieved through the use of several types of radiation and a few chemicals as the mutagenic agents. This methodology has been quite successful, though it has faded from public and media awareness, especially since the introduction of the newer methodology of genetic engineering. However, the story of mutation breeding is not complete without noting the sustained efforts made by China in taking it to new heights by sending seeds into orbit to expose them to cosmic radiation and micro-gravity in order to generate improved varieties. 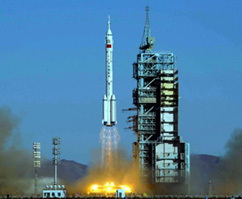 In 2006, a Chinese satellite carried some 2,000 varieties of seeds, including grains, fruits and forage plants into space for two weeks, where the seeds were exposed to cosmic radiation and weightlessness. After return to earth, the seeds were planted and used for breeding strains which could be disease-resistant, early-maturing, high-quality and high-yielding. While they have sent seeds into space (including high altitude balloons) since 1987, this was the first orbital mission specifically focused on mutagenesis. 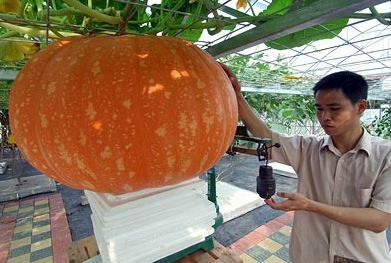 Two years after their space ride, some of the seeds were reported to be significantly enhanced, resulting in two-foot long cucumbers, 14-pound eggplants, and chili plants the size of small trees. The media reports are eye-catching, while the typically more low-key scientific reports on the modified plants document the changes in proteins and their expression, among other characteristics investigated. The pursuit of space-induced mutation breeding continues in the Institute of Crop Sciences of the Chinese Academy of Agricultural Sciences. Other countries, including the US, Russia and Australia, have also participated in examining what exposure in space does to seeds. There are even educational programs on this for kids in Canada and the US. The effort in China though appears to be the most sustained and most visible. With a population of over 1.3 billion, efforts to keep improving food production is critical to China and they are using innovative approaches. According to some of the media reports, the space vegetables are already being sold in the marketplace. This is in contrast to their insect-resistant rice, which they also found to be more productive, and which uses less pesticide and is safer for farmers – after ten years it still awaits approval for commercial release apparently due to concern over public acceptance of its development using genetic engineering as the method of modification. With increased public education efforts and the reality of future food demands, this will likely change and they will use all improved foods that have been shown to be as safe as other food. My view is that their pursuit of increasing food production using several modern breeding methods, including space mutation, is indeed impressive. Diversity and Stability Study on Rice Mutants Induced in Space Environment and see references 6-18.